Ants have a complex, interesting society and ant colonies hum along as busy places full of detailed activity and interactions (go watch A Bug's Life, it's clearly very complex). But, you or I might crush one by putting out a lawn chair without even noticing. Unless many of them are a nuisance, you might not give them any thought at all. But what if some other civilization felt that way about us? What if all our complexity, our buildings, our culture meant absolutely nothing to them, and didn't even register as "life"? Not a comforting thought. 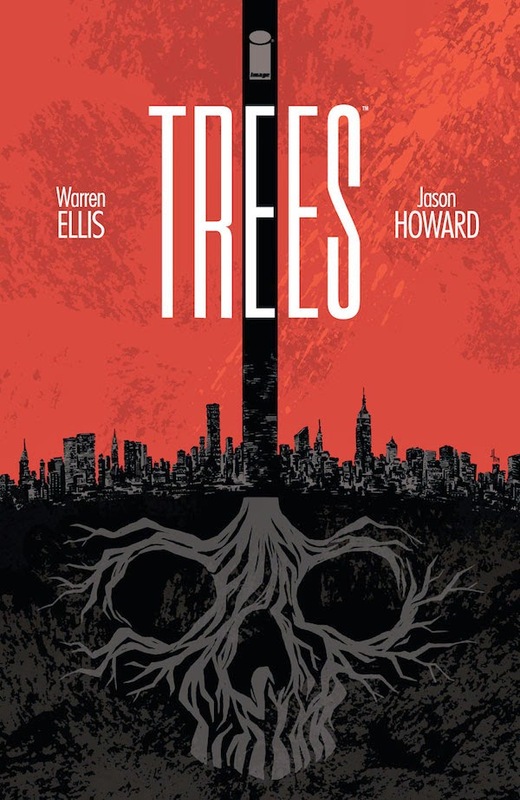 Thankfully, Warren Ellis (a master of bringing to life uncomfortable thoughts) has asked these questions, and the result is Trees, the new mini-series from Image with art skillfully provided by Jason Howard. In the world of Trees, giant tree-like monoliths (they look like black, stone, mile-high cylinders with geometric etchings at the bottom) have landed at various locations around the world. The series begins ten years after these "trees" have landed. The story begins in Rio de Janeiro, where the trees release toxic ooze (for lack of a better term), causing massive death and destruction. The story continues to New York,City. When the trees first landed, one came to be in lower Manhattan. The government tried to destroy it but apparently nuclear weapons are ineffective against the trees. However, the tree and the government response has left all of lower Manhattan flooded. Next, the story jumps to Shu, China, a walled city that has been built up around the trees. Lastly, the story moves to a tree that's landed in Spitzbergen, Norway, where a research crew is now stationed. Apparently throwing up around the trees is not an uncommon response. (This is a Warren Ellis comic, after all.) The researchers find, an unusual black flower growing around the tree which should could be the key to the strange growths' next move. Ellis uses these scenes to give readers a clear picture of his new world and introduce characters who will have roles to play in the plot before all is said and done. This first issue is mostly setup, but it's effective in exploring what kind of effect of an event like the trees landing on Earth would have on society. There is something very unsettling about the notion that an alien being, craft or object would land on Earth and be neither friendly nor actively hostile, but basically not acknowledge the existence of humanity (i.e., we are the ants and a lawn chair just dropped on our hill). Humans instinctively do not want to feel like who they are and what they've built is insignificant. The ideas here are ones that have been explored in science fiction previously (the monolith in 2001, similar large objects landing on earth in The Last of the Greats) but Ellis and Howard explore these ideas skillfully. Ellis has a real talent, across so many stories (The Authority, Planetary, Supergod), for creating worlds where big, cataclysmic events happen. Jason Howard is up for the challenge of conveying the scope of the effect that the trees have. The scene of devastation Rio is unsettling, and the New York scenes are ominous and haunting, in the way they evoke 9/11, Hurricane Sandy, and also demonstrate the ineffectiveness of military responses in many situations (as it sounds like the military response in New York only made things worse). 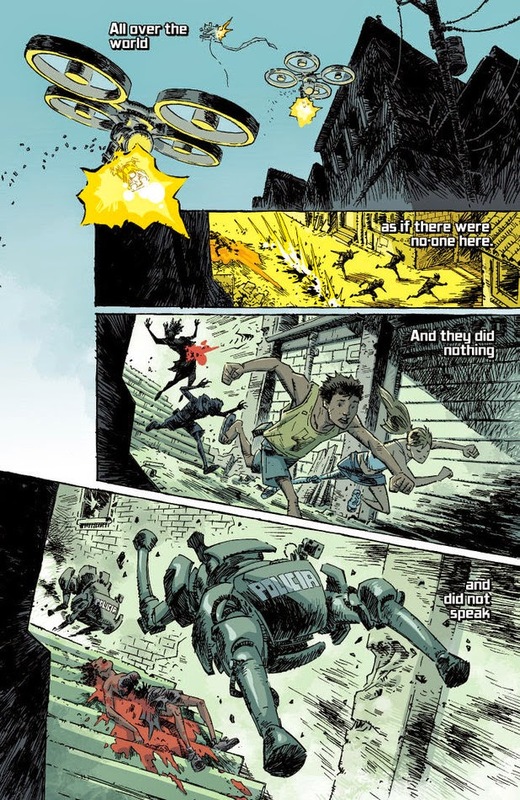 Howard's rough-lined style is in some ways reminiscent of John Romita Jr. (and completely different from Howard's other work on books such as Super Dinosaur) with a fair amount of cross-hatching; but for a rough sketch style, there's terrific attention to background details (graffiti on the walls, the contents of an office), and giving each setting a distinctive color palate. 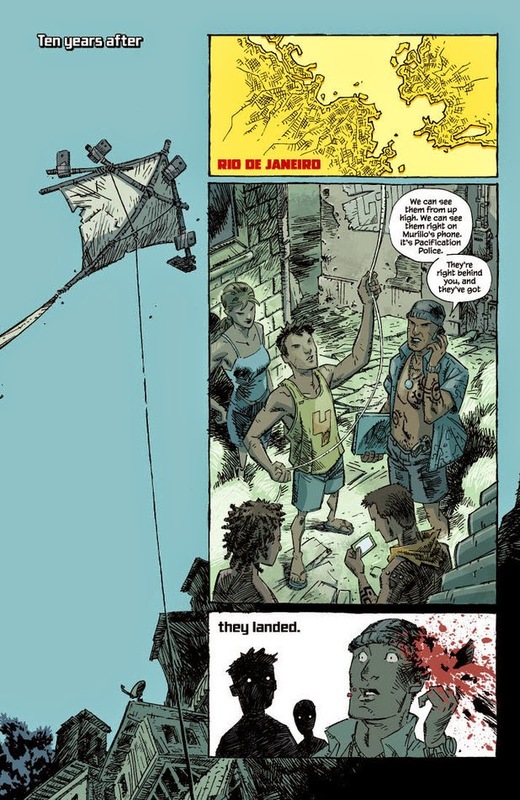 Like Romita, Howard does an excellent job portraying speed and motion; his scenes through the favelas of Rio fluidly convey the speed and danger of the youths being chased by police drones. Another area where Howard is very effective is in the facial acting; despite the economy of lines, Howard clearly communicates the emotion of the characters in each of the settings (eyes, in particular, are quite expressive). The art here is not what one might typically expect for a story about giant alien monoliths (one might expect something more traditionally cinematic like Bryan Hitch), but Howard's work conveys the mood, the danger, and the mystery of the story. This is a strong and intriguing debut which effectively sets the table for the world in which the story takes place. While not that much "happens" in this issue, Ellis and Howard are setting the stage and establishing the scope of an ominous, thought-provoking science fiction story, one that might make you tread more carefully around ant hills.